To complement its string of pearls: China eyes the Bering Strait and Russian coastline to solidify access to the European market worth US$550 billion in two-way trade last year. Made navigable by shrinking Arctic ice, this route potentially shaves 12-15 days off the journey through the Suez Canal and the Mediterranean Sea. The Yong Sheng, a 19,000-tonne vessel operated by state-owned Cosco Group, set sail on August 8 from Dalian, a port in northeastern China, bound for Rotterdam. According to an announcement on Cosco’s website, the journey via the Bering Strait could shave as much as 15 days off the traditional route through the Suez Canal and Mediterranean Sea. For more info on COSCO and its fleet of ships (including the Yong Sheng), please click here. 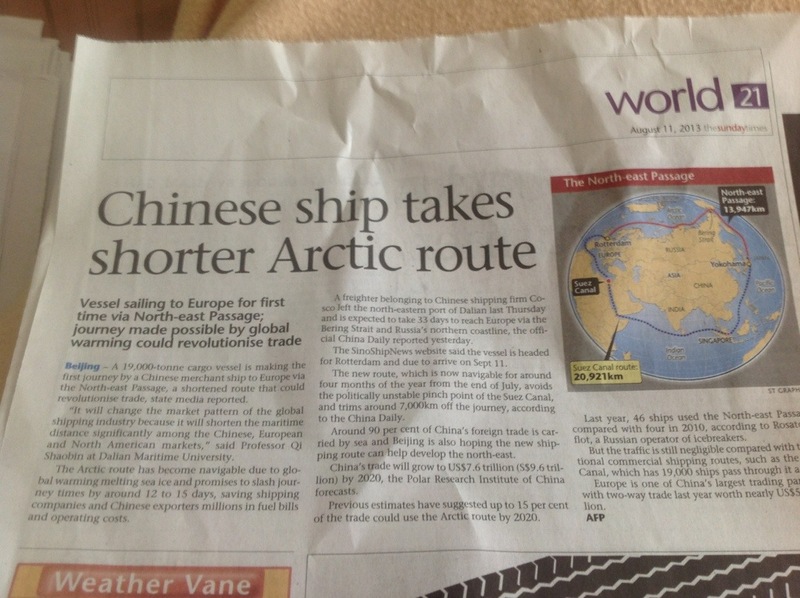 China granted observer status by the Arctic Council. China was granted observer status by the Arctic Council, giving the world’s second-largest economy more influence amid an intensifying search for resources in the globe’s most northern region. The eight-member council at a summit today in Kiruna, Sweden, also granted observer status to Japan, India, Italy, Singapore, and the Republic of Korea. The European Union application was deferred until members are satisfied that issues of concern — largely Canadian objections about EU restrictions on seal products — have been allayed. The number of new observers reflects interest in the region’s burgeoning economic opportunities as climate change alters the physical landscape. Rapidly melting ice is opening new shipping routes that will make the trip from Europe to Asia shorter and cheaper during the summer months. The softening of Arctic ice could also bring within reach the 30 percent of the world’s undiscovered natural gas reserves and 13 percent of its undiscovered oil that lie under the Arctic Ocean floor, according to the U.S. Geological Survey estimates.